Midwest death metal titans JUNGLE ROT will enter the studio on January 5th, 2018 to produce their tenth full length album. 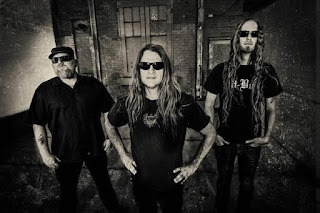 "Once again, we've stuck with the tried and true JUNGLE ROT formula to produce another killer record that all our fans and everyone will enjoy,” promises vocalist/guitarist Dave Matrise. “It's been nice to get back to doing what we do best and that's writing brutal, heavy music." The titles slated to appear include "Delusional Denial," "Glory For The Fallen," "Stay Dead," "Twisted Mind," "Fearmonger," "Pumped Full Of Lead," "A Burning Cinder,” “Triggered,” “Full Scale War” and “Send Forth Oblivion.” The band is also working on two as-of-yet unnamed cover songs. Recording will take place at Belle City Sound in Racine, Wisconsin with engineer Chris Djuricic at the helm. Mixing and mastering will be handled by the legendary Dan Swanö (Dark Funeral, Marduk), and accompanying the band behind the drums will be past contributor Jesse Beahler. The artwork will once again be created by longtime JUNGLE ROT album cover artist Gyula Havancsak and the record will be released in Spring 2018 on Victory Records (their fifth release for the label). Bassist James Genenz adds, "We've got quite a fire under our collective asses and we're psyched to get this album out! This is going to be a nasty record!"